You’ve done hours and hours of research trying to find out how to get a good, restful sleep. You have gotten the right mattress, a mattress topper, a sleep tracker and even a monitor that analyses the environment in your bedroom. All that helps until you realize that you haven’t solved the problem of your snoring partner. Or, the thin as paper walls of your apartment that allows for hearing the details of every one of your neighbour’s activities. Or, the fact that you live right next to a motorway and under a flight path by the airport. To solve the noise problem you have to take matters into your own ears. With earplugs, of course! The best earplugs for sleeping are the ones that cheaply and easily block those noises for some peace and quiet. They are a simple, yet, effective tool in your sleep arsenal. There are a few things to consider before you decide to plug up your ears. Your ears are a sensitive part of your anatomy and do need to be treated with care. Armed with some information you will be able to find the right earplugs for you. Ones that work, are comfortable and, most importantly, safe. 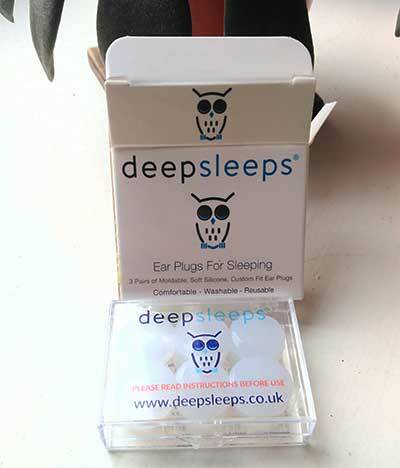 At the end of the article, you’ll find the reviews of our recommendations for the best earplugs for sleeping. Check out the table below for the rundown of our choices, click the name to go straight to Amazon and order yours. 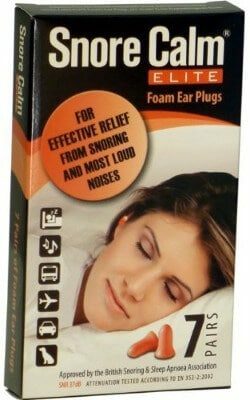 My personal Favourite is the Deep Sleep Soft Ear Plugs For Sleeping. They’re what I use and the ones I’m wearing in the picture at the start. The most dangerous potential effect of wearing earplugs is an infection. It isn’t common, however, it is something that needs to be considered. Earplugs can be a nice home for bacteria if they are not properly cared for. Particularly those made out of foam that is porous enough to provide a perfect breeding ground for bacteria. Putting infected earplugs right into your sensitive ears could send you to your doctor with a painful ear infection. Make sure you are cleaning your earplugs after each use or using disposable, one-use earplugs. You should clean earplugs with warm soapy water and allow to thoroughly dry before inserting them back into your ears. If you are using foam earplugs then soak them in hydrogen peroxide for a few minutes and rinse them under cold water. Again, allow to thoroughly dry before reinserting them. If you wear earplugs for a long period of time, it may affect your ear’s ability to drain wax. When that happens it is possible that the impacted wax will contribute to some uncomfortable side effects. Impacted ear wax can make you hear ringing or flutters in your ear. Even worse, it could lead to infections or hearing loss. So make sure that you are cleaning your ears more regularly than you normally would if you decide to use earplugs on a frequent basis. The best earplugs for sleeping can sometimes work too well. You may not hear the noises that you need to hear. A crying baby, for instance, might go unnoticed. A smoke alarm is usually high pitched enough that you will hear it. Most plugs allow high pitched sounds through. If you are sleeping deeply and wearing very good sound blocking earplugs, there is a possibility that you won’t wake up from the alarm. But this can be solved with some of the alarm clocks we recommend that shake your bed in the morning! The most important thing to look for is the noise reduction rating. The highest rating available is 39. That means that noises under 39 decibels will be blocked. For reference, a whisper is around 15 decibels depending on how far away the person whispering is. A normal conversation at a comfortable distance from you is around 60. A Hoover is around 80 when you are the one doing the cleaning. The further you are from it the lower it will sound. In other words, if it is coming from a neighbouring room with the door closed, you may not hear it with earplugs in. At least not loudly enough for it to keep you awake. The only way to find out which are the most comfortable is to try a few. Luckily, most are inexpensive enough to test out a variety to find the ones that you feel the most comfortable with. They should also be durable if they are meant to be worn multiple times. If they can’t hold up to being re-moulded to fit your ears or handle frequent cleaning, then it is time to replace them with a different brand. They should not only be comfortable but also easy to insert and pull out. If they are difficult to get a good fit, then they won’t be very good at blocking noise. Thus, useless. 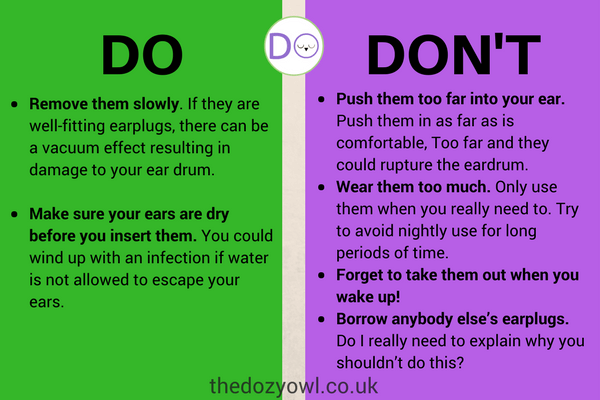 If they are difficult to remove, then they become a chore to use and will likely be left sitting on your night table collecting dust rather than in your ear providing you with a peaceful night of sleep. Wax earplugs have been made the same way for hundreds of years. Maybe even longer. A mixture of paraffin and wax covered in cotton, they are soft, easy to use and are easy on the skin. They are impervious to water and stay clean longer than foam earplugs. Since they are made of wax, they are easy to clean and usually last a while before needing to be discarded. There are many different types of foams being used in earplugs, but, the most common is polyurethane. The same type of material found in memory foam mattresses. This type of foam has the same properties of memory foam, namely, it bounces back so it makes a tight seal within the ear. The disadvantage of using foam is that they don’t last very long. Some can only be used once as it is porous enough to allow bacteria to grow. That isn’t the case with every foam earplug, however. Some are formulated to be very smooth and are not porous. The foam earplugs I will talk about further down in the article are great because they are able to be worn multiple times. Silicone earplugs are much like wax. They are little balls of pliable material similar to rubber that must be softened in the hands. They can then be placed in the ear making a tight seal. What makes them a bit different than their wax counterparts is that they bounce back a bit and mould to the inside of the ear better. They are also reusable and last much longer than wax. A common disadvantage to silicone earplugs is that they tend to be sticky leading to complaints that hair gets stuck on them. Not all of them have that property, and I only reviewed some that are non-sticky. These are the kind that you see construction workers wear. They have a flange attached that help you insert and remove them. For that reason, I declined to review any of this type as they aren’t well-suited to sleeping. The main event has come at last! I’ve gathered together the best earplugs for sleeping and provided a review of each. If you need them soon why not conside a Free trial of Amazon Prime to get speedy same day delivery on certain products. They are fully moldable much like wax, but last a much longer time. Just as you would do with wax, you must rub these around in the palm of your hands to soften them up enough to put over your ear canal. Once they are soft, form them over your ear and hold it there for 10 seconds. Unlike wax, the silicone will bounce back somewhat making for a more form-fitting seal. Also like wax, they rest flush against your ear and won’t be a distraction to side sleepers. Being made of silicone, they are very easy to wash and will last for a while before they lose their pliability. Unlike many silicone earplugs, these ones by Deep Sleeps are not sticky. They are quite smooth so your hair will not get stuck on these causing a distraction. Finding the right fit for earplugs is easy when you have the Z Zone earplugs. They have 4 different sized adjusters for different sized ears. The better an earplug fits, the better job it does. These don’t just block the sounds, they are designed to actually cancel certain pitches of sounds. They don’t block sound completely, but what they do is suppress loud noises. Putting them in the background so that they aren’t noticed as much. They are ideal for when you live in a high noise area like by a motorway or near a construction site. These are made with silicon, so, they are easy to wash. Just use some warm soapy water. It shouldn’t take more than 30 seconds to do this. One caveat is that if you have large ear canals these have a tendency to fall out when you are sleeping. They are adjustable, but they fit best with small to medium sized ear canals. Also, unfortunately, the manufacturer doesn’t give the sound rating for decibels. The handy travel case makes it a great option for travelling. The most popular earplug on the market and easily identifiable with their distinctive yellow colour are the EAR classic earplugs by 3M. One of the reasons they are so popular is that they are very comfortable. They are easy to mould to your ear and they don’t pop out easily. The foam is water resistant and anti-allergenic. They are meant for single use and throw away, but, since they are water resistant you may get away with multiple uses since they can potentially be washed. The low price makes it impractical, though to consider this. They are cheap enough to wear once and replace when the pack runs out. They’re soft which doesn’t put much pressure on the ear which can often lead to headaches with prolonged use. Once you get used to them you don’t even know they are there. They are also non-flammable, which seems like a good quality. Until you realize that if there is a flame close enough to your head that there is a risk of your earplugs lighting up, I don’t think it matters too much how inflammable they are! At a rating of 29, they are not the quietest earplugs on the market. But the comfort, ease of use and tight seal make it worth it if you are not in a high noise area. They protect well against a snoring partner or noisy neighbours. Inserting them is easy, but, there is a little trick to ensuring that they mould to perfectly fit your ear. You must compress them in your fingers to insert them into your ear. The trick here is to lightly press the end after inserting in your ear and holding it there for a few seconds. It takes a moment for the foam to recover and pop revert back to its original size. Once it does, you will have an ergonomic fit that moulds specifically to your ear. The extra few seconds taken to get the right fit in your ear will not only more effectively block sounds, but prevent them from falling out during the night. For the price, and ease of use, these plugs are an excellent choice. You won’t worry about losing these earplugs if they fall out! The bright colors are unmistakable. The contoured shape makes it a snap to put them in. You won’t likely be losing them anyway as the bell shape and self-adjusting polyurethane foam will mould to any ear making it a personalized, snug fit. Unless your ear canals are unusually large, these will fit about any ear. They are disposable and meant to be thrown away after each use. It seems like that they can be used a few times before they begin to lose their shape and effectiveness. They also block dirt build up. If your ears aren’t very waxy they could last a few nights before tossing. With a rating of 33 for noise reduction, it will block out most background noise. When you sleep next to a seriously loud snorer or you share a flat with a bunch of party animals, you need some extreme protection. That’s why many people choose the Snore Calm Elite earplugs. They are rated at an incredible 37 decibels and block out many loud noises. The soft polyurethane foam is comfortable and snug fitting. Some ear plugs are good at blocking sound but don’t provide much in the way of comfort. Which defeats the whole purpose. If an earplug has you sleeping poorly due to discomfort, or, have you waking up with a headache, they are not worth using. These will effectively block sound and provide incredible comfort. Side sleepers will have no issue with the profile as they don’t protrude out from the ear much. The only negative is that the foam is a bit smooth and may fall out of the ear if you have larger ear canals. These are on the pricey side but can be worn multiple times. Of course, if you value your sleep then the price won’t be much of a reason to not buy such a good way to block out sounds. These wax earplugs are some of the best fitting earplugs around. The wax is easily pliable after working around the palm of your hands for a few moments. 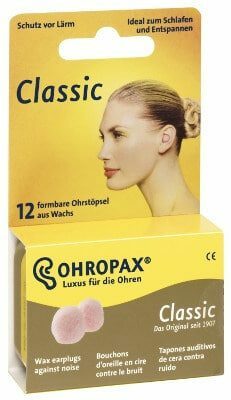 The soft wax forms a tight seal over your ear canal blocking out sounds as well as water. Without using much pressure to mould to your ear means less pressure on your ear. Less pressure equals more comfort. Fitting flush in your ear, they lend themselves nicely to side sleeping. Wax earplugs will stay put at night, as well. They also are able to be worn multiple times. Especially if you wash them with warm soapy water and your hands and fingers are clean when you insert them. Unfortunately the manufacturer hasn’t given what the noise reduction rating is for these. However, they are very good at blocking the sounds of snoring or neighbours dogs barking or similar decibel sounds. They are silicone and come in small cans like a putty. They truly are DIY as you have to take a bit of the putty out of the can and rub it around to get it pliable. Then you must insert it into your ear with your mouth slightly open. Biting on something works great here. 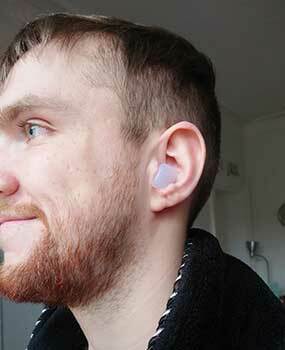 After a few minutes, the silicone will be a perfect mould of the inside of your ear. 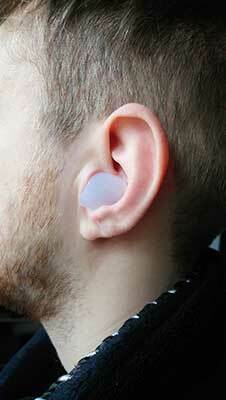 You now have a personalized earplug that will always retain the exact shape of your ear. They might seem labour intensive to make them. But, the superior fit and comfort make it worth it. As an added bonus you can also use them in conjunction with your headphones for listening to music without the buds falling out of your ear. Not only will the buds stay in place, but the perfect seal allows for much better sound quality. I digress, though. You’re here to improve your sleep! Q: What can I do if my earplugs are uncomfortable? A: If you are new to wearing earplugs for sleeping then it may just be a case of getting used to them. Read the directions to see if you prepared them for use before you inserted them. 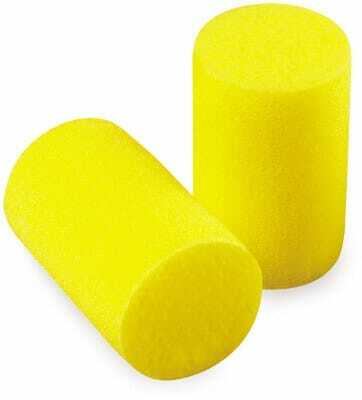 Some earplugs need to be rubbed around to loosen them enough to form to your ear. In any case, give it a few nights before you decide to try different ones. Q: Can I have a conversation while wearing earplugs? A: Yes. A typical conversation is around 60 decibels. If you have earplugs that block sounds up to 39 decibels (the max for earplugs) then you will be able to hear the other person speaking. Q: What kind of earplugs work best? A: This is a matter of individual preference. Whatever is the most comfortable for you is probably going to work best. In most cases, an earplug that moulds to the shape of your ear will work best as it will make a tight fit and block more noises. Silicone and wax are great for that. Q: What if my earplugs are causing me pain or make my ears ring? A: You may have an infection or damage to your ear. Earplugs should never be painful. They can be uncomfortable if you aren’t wearing ones that are right for you, but, pain or ringing in your ears is not normal. Stop using them immediately and if the pain and ringing persist, see your doctor as soon as you can. It’s not often that a solution to a problem can be so inexpensive. In many cases, especially when you are fatigued, the most expensive measure is tried first. Sometimes to no effect. It could be just a matter of putting some earplugs in to block out noise that you might not even realize is disturbing your sleep. Though not exhaustive, this list of the best earplugs for sleep will certainly help to point you in the right direction in finding your ideal sleep solution. If at first, you don’t think that earplugs have helped, you may just need to find the right one. Try a few different ones and see if there is one out there that suits your needs. Do you have any questions or thoughts about earplugs? Let me know in the comment section below. Maybe your experience could help other sleep sufferers find the rest they need. I’ve tried all types of earplug. At the moment, I’m using Moldex Pura Fit foams, sealed with 4 wax earplugs (2 on each side). I still can’t keep out the noise of my neighbour, who lives in the flat above! Especially impact noise- hard shoe on hard floor, windows slammed, cupboards and drawers slammed throughout the night. I’m considering buying Bose sleepbuds. They are very expensive, and I can’t be sure they will do the job properly! I would be grateful if you could send any advice by me, concerning the above. I’m now in a desperate situation, as the housing association won’t do a thing about it! I know the pain of noisy neighbours well! Sorry to hear you’re having such difficulty, hmmm, yes if they’re making that much noise it can be very difficult with a standard earplug, I haven’t tried the sleep buds but I have a pair of Bose over-ear headphones that do a fantastic job of blocking out noise, which is why I keep missing the postman when he’s at the door! I like using the yellow classic earplugs for going to the gym, as it blocks out the irritating noise, but easily lets me hear the instructor and conversations. Most instructors like to play loud music, but with the earplugs, the loud music doesn’t bother me. Something I do not understand is that earplugs allow you to hear conversation so how on earth do they block very loud snoring? The ones I can mould myself look most appealing to me. Foam ones fall out, wax ones also do & I sm taking s holiday, sharing with a friend who snores very loudly!